I arrived in Georgia’s Black Sea port of Batumi via an overnight train from Armenia. I was looking forward to getting off the schneid with my first legitimate tournament victory (walkovers don’t count). But when I made my way to the Tennis Club Batumi on my first morning here, I was blindsided by a pair of unwelcome surprises. One, the facility is hard courts: eight gleaming, immaculate, body-destroying hard courts (I thought I’d signed up for a clay-court tournament). Two, the tournament was scheduled to begin not on October 8, as I’d been anticipating, but October 11. These two developments were so disconcerting to me that I considered withdrawing from the tournament. I’d been bothered lately by intermittent pain in my right Achilles tendon, which hard courts could exacerbate, and I had airline reservations to fly to Tbilisi and then on to Paris on the evening of October 11. I decided to explain the situation to the tournament director, ask for a morning start time and then leave Batumi after my match win or lose. Batumi itself was also delightful. With its languid Old City cobblestone streets, pastel-colored residential buildings and ordered rows of palm trees, it’s a cross between Miami Beach and Santo Domingo. The several five-star hotels all boast casinos. Why isn’t such an attractive city better-known? I wondered. It may soon be. Construction is going on seemingly everywhere, with none other than Donald Trump lending his name to a massive waterfront hotel that is nearing completion. One reason for Batumi’s relative anonymity might be that its beaches are not, well, beaches. Unless your idea of a beach is rocks. For some people it apparently is. They simply place a chaise lounge atop the rocks. Others clear away the larger stones until they hit gravel and then spread a blanket on top of that. Even in early October, Indian summer prevailed and during my one week here there were a couple of beach days. But my three-month run of luck with the weather finally ran out. Most days were overcast and there was some rain. However, I did continue my luck of finding good hitting partners. 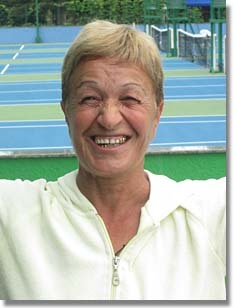 Avi was a well-built, thirtyish gravel-voiced Georgian who had lived and taught tennis for several years in Bensonhurst, Brooklyn. I hit with him twice, and although he had a gruff personality he gave me lots of feedback, including advice to toss the ball at one o’clock for serves into the deuce court, and twelve o’clock for the ad court. The morning before the start of the tournament was registration. Name tags were distributed, like at a convention. Then the youngish, wiry director gathered everyone in front of the clubhouse and explained the ground rules. One of the players, a petite blonde woman named Eya, took it upon herself to be my personal translator. Earlier she had seen me standing alone and insisted on including me in a group photo. She kept coming over to me to provide updates on his spiel. (“Now he saying after finals matches will be party for Georgian cuisine.”) Other players were friendly to me too. Maybe it was the name tags. The next morning, hoping to find someone to hit with, I arrived at the courts well before the start of my match. An extremely short, overweight older woman named Ophelia (“like Shakespeare Ophelia”) came over and made a hitting gesture. I was flattered. Yesterday I had seen her hitting rings around a much younger, stronger man. If you didn’t know better and she asked you to hit, you’d feign a heart attack. But she was unique. Her volleying was especially amazing. She never seemed to miss a half-volley or overhead; she was probably four foot ten and yet I couldn’t lob the ball over her head. She also gave me pointers. (“Richard, look, you must bend knees more.”) We hit for around forty-five minutes and I wished it could have been longer. Alas, our session did me little good once my match began. I’d like to blame it on circumstances beyond my control. According to the draw sheet, I was supposed to play one of the contingent of players from Turkey. But the tournament director informed me that there had been a change. “None of Turkish players arrived in Georgia,” he explained. He found a substitute opponent for me. Alex was a tall, rangy Georgian who told me he used to work at the Leila Meskhi facility in Tbilisi, where I had trained the previous week. He was a very solid player whose game seemed to have no weaknesses. The surface didn’t help but even on clay he probably would have won. At least I have Paris to look forward to.